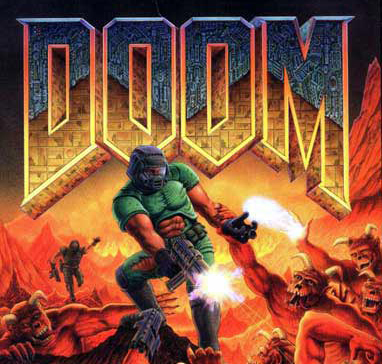 DOOM is my favorite video game and a major source of inspiration for me as a horror writer, as an artist, and as a video game designer. This project began as a simple exercise in horror narrative and blew into a rather ambitious fanfiction project in the spirit of H. P. Lovecraft. I hope you, dear reader, find enough nightmarish thrills in these stories to taint your dreams for weeks to come. So sit back, dim the lights, and have at! A research facility on Phobos is ravaged by a demonic invasion, and a lone space marine struggles with his sanity as he tries to escape the doomed moon. The survivors of the Deimos Base invasion — and the dimensional relocation of the moon itself — make several bold attempts to contact earth and alert humanity of what has happened. A squad of marines and scientists is sent into the demon realm to recover stolen UAC technology, but all they find is a horrifying revelation. Mom and Dad, and the staff of Id Software circa 1993. Hey. I really, really like these stories and think you should finish Inferno. Thanks for writing them! Your wish is my command! Inferno is done! Quite the pleasant surprise when I heard about it. Thank you for finishing it after all, it’s not only good but it’s inspired me to possibly write something of my own. Just finished Knee Deep in the Dead. It was very good. I’d also love to read more! Oh my god, loving the stories! i’m finishing “THE SHORES OF HELL” right now. Awesome work. Shores got an expansion and a rewrite, vastly improving it. Take a look! I finished Inferno a while ago. Loved it. Can’t wait for the next! I usually despise the letter/journal entry style of writing, but it works really well in these. Keep up the good work! Well, I probably won’t do another entry unless I get paid for it by a publisher or something. But I’m glad you liked the trilogy! Someone get this man a publisher! Or a Kickstarter! I think you said once you might do Thy Flesh Consumed and/or DOOM II. Not that I’m going to get in your case about it, because it’s your choice and you’ve already done us all a service.